Kronhuset in Gothenburg at Kronhusbodarna - the oldest building in Gothenburg, Sweden. 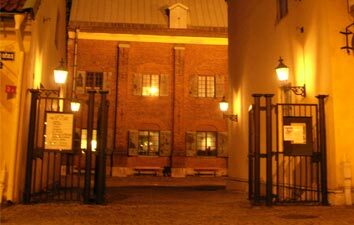 When you have walked around in Gothenburg we think that you also should see the place were the Kronhuset and Kronhusbodarna are located. It isn´t far from the Square of Gustav Adolfs Torg. Here you will see the oldest building in Gothenburg that isn´t a place to live. Kronhuset from the middle of the 1600´s. At the place you also will find so called sheds, with different small stores that reminds you of the earlier days. To get to Kronhuset and Kronshusbodarna will go quickly if you are standing on The square of Gustav Adolfs Torg. Then it will only take you 5 minutes to walk from the square. Kronhuset was built 1642-54 in dutch stile. The building is fire-red with a copper roof that are glowing in green and tieh their nice windows. This building was firts usted as a shelter for guns, ammunition, uniforms and food etc. To the year 1954 it was a shelter store. After that is was restored and became a museum. Today the Kronhuset is also used as an concert hall. 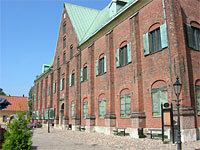 Kronhuset also has been involved as a government hall during two winter months in the year 1660. 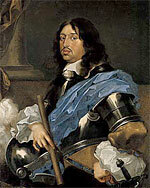 During this time Sweden had to discuss its future and King Karl X Gustav came to the city a cold winterday in november 1659. He was a little bit sick... but that should be a problem...... Christmas came and the meeting with the member of the government (at this time of period, nobility, priests, burgher and and peasents) started Jan, 4. The meeting ended and the King was still in town and his health became worse. Karl X Gustav died the night Feb, 13 1660. He died in the residence at Södra Hamngatan 3 (the so called Torstenssonska huset). 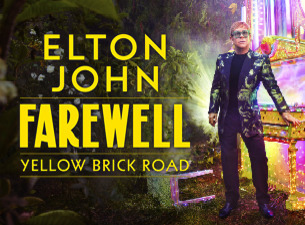 The enemies to Sweden must not know that the King is dead. All the gates in town were closed and a new King had to be announced as guickly as possible. Karl XI who at this time only was 4 years old was the new King. He was carried in to Kronhuset and was announced as the new King. But not until year 1672 when the King was of age he could take over the throne officially. During this time Sweden had a so called guardianship government. What can you more find at this place? You can have a cop of coffee and a sandwich at the Café Kronhuset and shop crystal in Glashyttan by the designer Helena Gibson. If you feel for biscuits and candy don´t miss Gothenburg Chocholate and Candy fabric. Maybe you are carrying around an old watch that doesn´t function, then take some time to fix it at the Klockboden of Gerard Gren. Why not buy a new par of mugs in potter for your tea. Visit the store of Mia Bäxs and view her fantastic things. If you need a new handbag or a new wallet you can visit Laura Didion leather factory. She hand makes all her leather goods. You can also make a visit to the very small park that it located beside Kronhuset. Winter: At winter time you can come here and just stroll around among the stores and take a mug of glögg (a Swedish christmas drink) and just feel the atmosphere. In December there is usually a Christmas market inside Kronhuset. They were built between the years 1764-1759 and their function was storage for railway material and also worked as a firehouse. Today you will find these stores here: Glashyttan, Göteborgs Choklad & Karamellfabrik och Laura Didion. They were built between 1746-1748 and at that time there were a smithy, a wheel maker and a small fabric here. 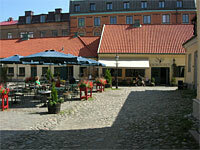 Today you will find these stores here: Krukmakeri, Urmakeri, Jama Produkter and Café Kronhuset. 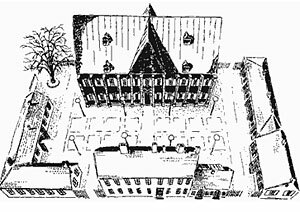 The whole area cought fire both 1746 and 1758, all the buildings except for Kronhuset were burnt down.